I can report that the BCS Journal, The Clematis, is now completed and will be published and distributed in the coming few weeks, to all Members. I very much hope everyone enjoys this year's Journal. Look forward to the Journal. Is the BCS selling copies at the Cambridge Meeting? I'm not quite certain yet whether copies will be available in time for Cambridge, but, hopefully they will be. The printing is set for next Tuesday 16th with binding and posting shortly after. Unless the printer changes the schedule, the 27th should hopefully be fine. To save courier costs I may go and pick the remainder up myself and bring them down to Cambridge, if they are ready to be collected by then. Thanks Brian, for the information. If so, I will buy a copy which I will send to Peer. Pleasingly, the printer has today moved completion of the Journal forward, so printing should be 15th (and binding the 19th) which means that this year's Edition could well be in the post over the course of the week following. This is exactly the same printing date as last year, so with luck Members should begin to receive their copies before the end of October, again. If the timetable changes at all I will post the details on this thread. As usual, the Journal, with 320+ photos and 35+ articles, has been a massive (but enjoyable) task to compile, edit and produce; hopefully the results are reasonable and I am sure there should be 'something for everyone' in this, my 6th Edition. 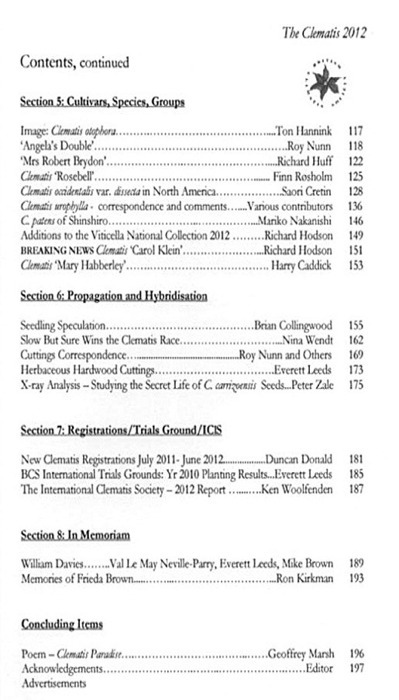 I really should not single out individual Authors because every input is highly important and very gratefully received, however, as well as the general clematis articles we have one or two more substantial essays this time around, of particular historical BCS relevance, which I am sure people will find a lot of interest in. This year I was extremely lucky to receive significant material (with common threads) from Tom Bennett and Marcus Eyles among others, which I know will prompt a lot of personal recollections and provide a great deal of insight. 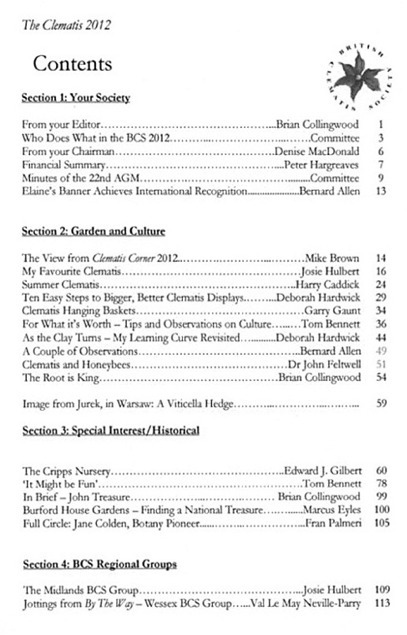 Without giving too much away, Tom's excellent and humerous article covers BCS and Clematis events from the early years of BCS and beyond, including his involvement with Burford House and his friendships with John Treasure and Christopher Lloyd; during compilation (which took several months) I was very fortunate to receive supporting input and pictures from contempories and others associated - particularly, Harry Caddick; the whole thing knitted together neatly into an intriguing historical chapter. I hope you will be as 'glued to it' as I was. Whilst in the throes of building this item Marcus Eyles very kindly provided invaluable insights into the past and future of Burford House and its clematis associations - I very much hope to return to expand on this particular theme, next year. Richard Hodson (National Viticella Collection Holder) provided news on interesting new cultivars and on one plant in particular which I am sure will generate serious interest for clematis enthusiasts! As usual, Roy Nunn's input was invaluable, as was that of many others, too numerous to mention, but no less valued. I once again must thank my proof readers, Glenis, Val, Sue, Keith, Mike and Everett, without whose help many errors would slip under the radar. During a particular time period in the year I bombard them daily with emails and files but everything is dealt with promptly, allowing me to get on with it and have confidence in the final results. Many thanks to Bernard Allen once again, for converting slides into good digital images. 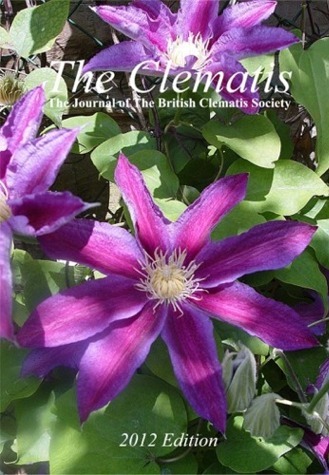 The BCS Journal The Clematis 2012 is now printed and will be posted to Members in the coming week! Needless to say, BCS very much hopes everyone enjoys this year's Edition, which is full of clematis information, articles and photos. For anyone wishing to join the Society, and thereby obtain a copy of the new Journal, among lots of other benefits, details can be found on the Membership section of this website. I have just got back from the Publisher after collecting the early copies of the Journal and it all looks fine and good quality. Members' copies will be posted this week and all should receive in the coming several days. I hope everyone enjoys this year's Edition. The Journal has been posted out to all Members today and will arrive shortly. Brian a beautiful journal. Today I have got the journal and my first impression is a colorful journal with a lot of interesting articles! Yes, some interesting reading hopefully, Ton; good to know it is arriving everywhere now, and, nice to receive some feedback! 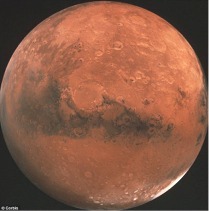 I hope you enjoy it, it seems to have gone down reasonably, from what I've heard so far. Do all of you have got it already? I'm still waiting, but the post from England to Finland has also earlier been extremely slow. Hi Timo, I don't know what has happened to your copy so I have already requested that another is sent to you, it should be with you shortly. Could you please let me know when received? Thanks a lot. Thank you, Brian! Today I got my copy. Great, thanks Timo, I wonder where the first one went?